Twirl your way into your next special occasion with this showstopper maxi dress. Featuring an eye-catching purple ombre satin print, v-back detail and a separate waist tie belt, this dress ensures all eyes will be on you. I love the colour,the design,in particular,love that it has pockets. I am going to wear this to a christmas wedding. Unlike in the photo.it is full length on me.and not so puffy.which suits better. Well done Roman .you always have the right out fit for special occasions. Lovely dress, not heavy but looks very luxurious. Beautiful dress, fits amazingly and fast delivery. This dress is absolutely beautiful, worth every penny. I bought this dress for a dinner dance and it was lovely I had some very nice comments about it. Beautiful fit and lovely fabric. The whole dress is very well finished. 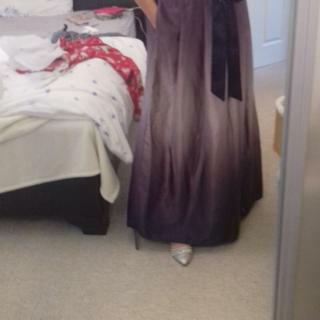 This is a beautiful dress, I ordered a size 16 which I normally am but it was to big on the top, I decided to try a size 14 and that fits great apart from being about one and a half inches too long, witch I can get altered, I am 5’2’’. Very pleased with my purchase, put it away for our future cruise. Perfect fit ,dress is a lovely length with my kitten heel. Colours as photo really nice dress. Perfect dress, so pleased I bought it. Gorgeous dress, perfect fit, much admired. Love it. Luxury evening dress at a very resonable price. This Evening dress is sumptous in looks and looks fabulous on.Thankyou for the 'Black Friday deal. Loved this dress it looked great and fitted well. Is the top Black or purple ? BEST ANSWER:The bodice of this dress is black and the skirt is a purple ombre effect.